Just sharing some more of my journal! 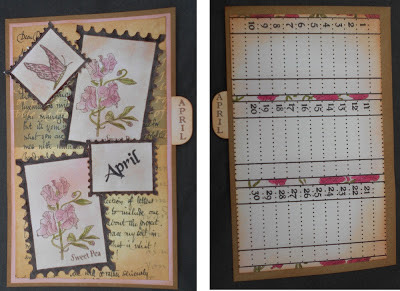 The main stamps on these pages were made using the following Dimension Stamps stamp sets It's a Date Calender set (ref: 2400070a) and Forever Floral (ref: 2400061a). I think April has to be one of my favourite pages it came together so quickly but I just love how it looks. To make this page I used the Postage Stamp set (ref: 1808011A) and stamped two of the largest and middle sizes postage stamps. Into the two largest ones I stamped the Sweet Pea and the word "Sweet Pea". 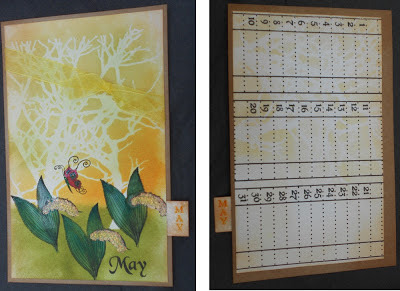 Then in one of the middle size ones I stamped "April" and a butterfly from the Butterfly Background (ref: 0604066A) in the last one, these were all coloured in and blackout the edges of the postage stamps. For the background I just used some paper and matted it onto pink card before attaching it to the page. I added the postage stamps and then covered them in crackle paint to add some texture. For calender part I masked off the grid then randomly stamped the Sweet Pea in the gaps and coloured them in then distressed around the edge. For May I wanted to get that woodland feel! To make the background I used a "twiggy" mask and tried to create the feeling of a sunny spring day. I then stamped the "Lilly of the Valley" three times, and a butterfly from the Butterfly Background (ref: 0604066A), then I coloured these in. 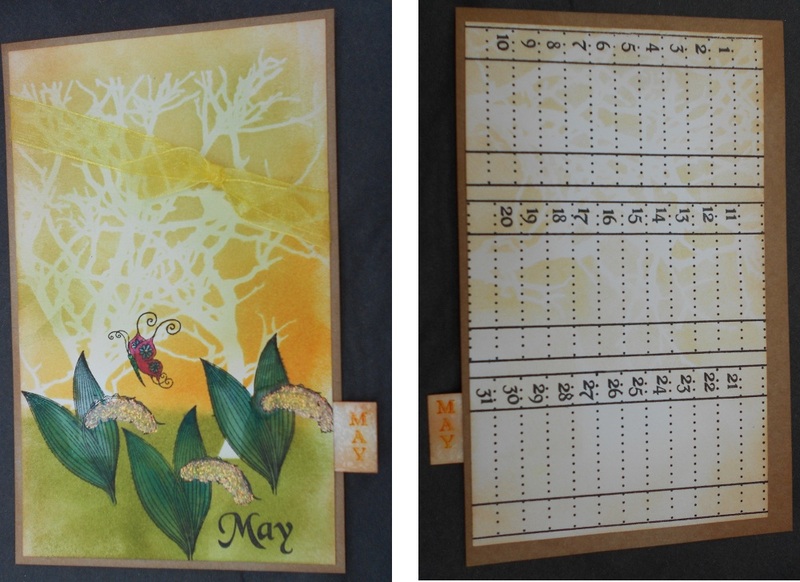 Finally I stamped the word "May" in the bottom corner, added a ribbon across the top and added some stickles. For the calendar part I used the mask again. For June I die cut a bird out of patterned paper and it's wing out of plain white card. Next I cut a square of white card and stamped the Rose to the left hand so it looked like the bird is holding when I stuck it back down. I then stamped the word "Rose" twice in each corner so that I could put a brad between the two word. I then stamped the rose head onto the wing. Next I coloured in both the roses and distressed around the edges. This was then matted onto black card then I added brads to each corner. For the background I choose some matching paper and added a strip of white card to the bottom where I stamped "June" and two Roses. I then distressed around the edge. To finish this page off I added ribbon over the edge of the white card. 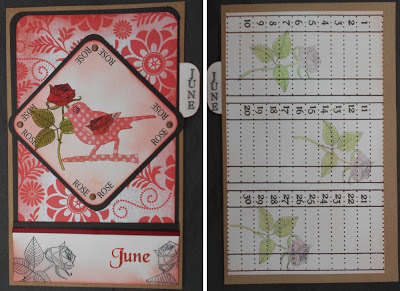 On the calender page I stamped the Rose onto each of the grids and coloured them in (lightly!). I think this would make a nice Valentines day or Anniversary card!